So many things to do this weekend, so little time! Which one will you choose? Below, find 14 kid-friendly events happening this weekend in and around Boulder. Cost: Adults $18, Seniors $13, Students $9, 4 and under $4. Limited tickets available at the door for $2 more per ticket. Tickets available here. BackStory Theatre continues a tradition of excellence in youth theatre for all ages with its 6th annual musical production, Mary Poppins. This full-length Broadway show features many of the songs you know and love along with your favorite characters. Join Jane and Michael as they journey with their pal Bert and “the Perfect Nanny”, Mary Poppins, to fantastic places outside dreary ol’ London. This year, BackStory advanced performers are joined by the advanced performance troupe from DanceArts Studios in a collaboration that’s sure to have you tapping your toes. CU Wizards – Superheroes Within! At CU Wizards: Super Heros Within, CU Physiology Professor Moni Fleshner will teach kids about some great “superheros”, the cells and organs of the immune system that fight germs! With the help of “Anatomy Bob” and examples from a mouse, a rat and a human, Dr. Fleshner’s show will highlight one very important superhero in the body involved with fighting germs, the spleen! Join Boulder’s Farmers Market this Saturday for one last outdoor market before winter finally sets in. This incredible season saw piles of fresh veggies, and this weekend the tables will be stacked high! There will be a Weigh Your Haul Contest – the person who has the heaviest haul will win a fabulous prize. Enjoy hot apple cider and a fun scavenger hunt. Light up the season in Estes Park at the 7th Annual Tree Lighting Ceremony. This event has become an Estes Park tradition with its unique characteristics and community recognition. Guests are welcome to visit with Santa, enjoy cookies and hot chocolate, browse the area shops, and enjoy live entertainment. The ceremonial lighting will occur at 6pm. Cost: $2 Residents, $5 Non-Residents, Register here. Here’s your chance to win a Thanksgiving turkey! Shoot free throws to win a Thanksgiving turkey at Lafayette’s Turkey Shoot Free Throw Contest. This event will consist of different age groups for both male and female divisions. Turkeys will be awarded to the top shooter in each category. For more information, call the Recreation Center at 303-665-0469. Check out the Santa Cellar Craft Fair, held at the Broomfield Community Center. Our Annual Santa’s Cellar Craft Fair features five rooms filled with local crafters from Colorado. Santa visits from 10 a.m. until noon! Find something special for everyone on your list. The Ninth Reindeer Cafe will be open during the Craft Fair from 8 a.m. – 1:30 p.m. for your snacking needs. Located in the Lakeshore Room. Take a look at the Breakfast and Lunch menus. At I Want to Be an Astronaut, see and feel what it is like to train for launching into space and exploring the planets, moons, comets and asteroids of our Solar System. Kids will get a chance to do hands-on activities, ask questions, and even try walking in Micro Gravity Boots! No reservations required. The Butterfly Pavilion is offering admission for just $5 on Saturday, November 18. Home to over 5,000 animals, kids will be immersed in a tropical rainforest where 1,600 butterflies live and Rosie, the tarantula is ready to be held by brave children. Step to Water’s Edge to be immersed in an underwater world full of sea creatures. The pavilion also features lovely gardens and a nature trail, as well as a fun gift shop. Cost: $35/ticket. Tickets available here. Join Color Me Mine to celebrate Mickey Mouse’s birthday! Kids will be painting a Mickey Mouse figurine. Drop your school-ager off at CMM Boulder for a FUNtastical & ARTmazing time! Crafts, games and pizza will be served! Reservations required. Call Color Me Mine Boulder at 303- 443-3469 with questions. Check out the Tri City Elks / American Legion Auxiliary 15th Annual Holiday Craft Bazaar in Louisville. Handmade crafts, gifts, art, carvings, bake sale, door prizes. Partnership fundraiser for American Legion Auxiliary and Tri-city Elks. Once a month the Children’s area of the Broomfield Library hosts a special music program for ages Newborn to 24 months with caregiver. This Saturday, enjoy Rhythm Rascals with Kelly Sokols. No registration is required! 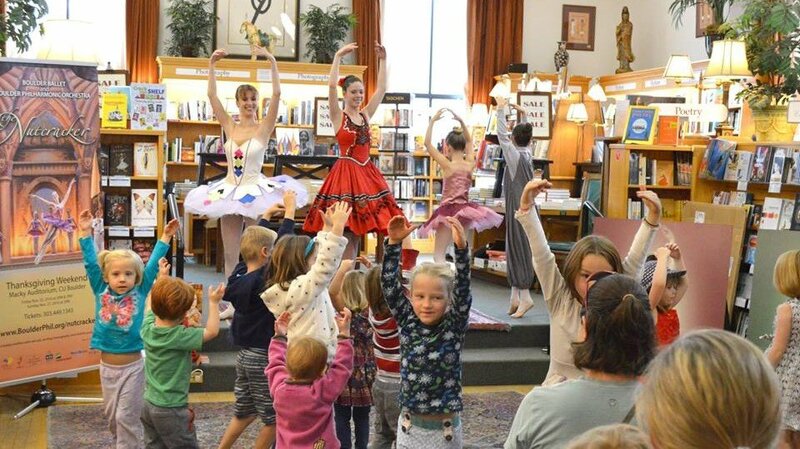 Three company dancers from Boulder Ballet will join Barnes and Noble Boulder in the Children’s Department for a fun, festive reading of the classic holiday story, The Nutcracker. Dress up and tutus encouraged! All ages welcome. Switch on the Holidays is back with a holiday sing-along performance led by the Boulder Children’s Chorale joined by members of the Boulder Chorale lead up to the grand illumination of the Boulder County Courthouse and the Pearl Street Mall, with a special appearance by Santa himself! Then stick around for FREE visits with Santa until 7:00 p.m. For more information, visit: https://www.boulderdowntown.com/light-up-the-holidays/events/switch-on-the-holidays.